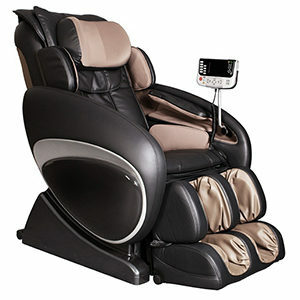 MassageChairDeals.com - Infinity & Osaki Massage Chairs! Need Help Finding Mom the Perfect Massage Chair? Call us at 844-862-4391 or Talk to a Specialist via Live Chat! Extended roller chairs massage from the neck down the lower back and into the seat, reaching the gluteal muscles and upper hamstrings. 3D chairs allow you to alter the depth of the roller track, pushing the rollers deeper into the back to receive a much deeper tissue massage. The NASA-inspired recline position is the most popular way to enjoy your massage. It relieves stress and distributes your weight, giving you a “weightless” feel. Chairs at or under $3,000 often provide plenty of premium features that would make most happy. Shop the 4000T, Escape, Executive and more. MOTHER'S DAY SALE Call or chat with us to learn about unadvertised Mother's Day massage chair deals. Call toll-free at 844-862-4391 or talk with a Massage Chair Specialist via Live Chat! A friendly Massage Chair Specialist is available for support 24 hours a day. Have question? Need help narrowing down a model? Want to place an order? We are available by phone, chat, or email. Customers in the United States are not subject to sales tax, except those in Illinois. The price you see on MassageChairDeals.com is your final price. No upcharges. No gimmicks. No confusion. A massage chair is a big investment. It's not easy shopping for a chair you may have never sat in before. We strive to make it easy to shop for a massage chair. Get in touch with us and see how we can help. Regardless of your budget, every massage chair is shipped with complementary curbside delivery. Simply bring your chair into your home or business, assemble it and begin your therapeutic massage session. In Home Set-Up Delivery is also available for an additional cost. Find a massage chair for less elsewhere? Get into contact with us and we can price match the same chair for you. We might even give you an additional discount for your troubles, too. We have up to 36 months of financing available to get the chair of your dreams in easy installment plans. Simply choose your chair, proceed to checkout and begin the qualification process. Terms apply.